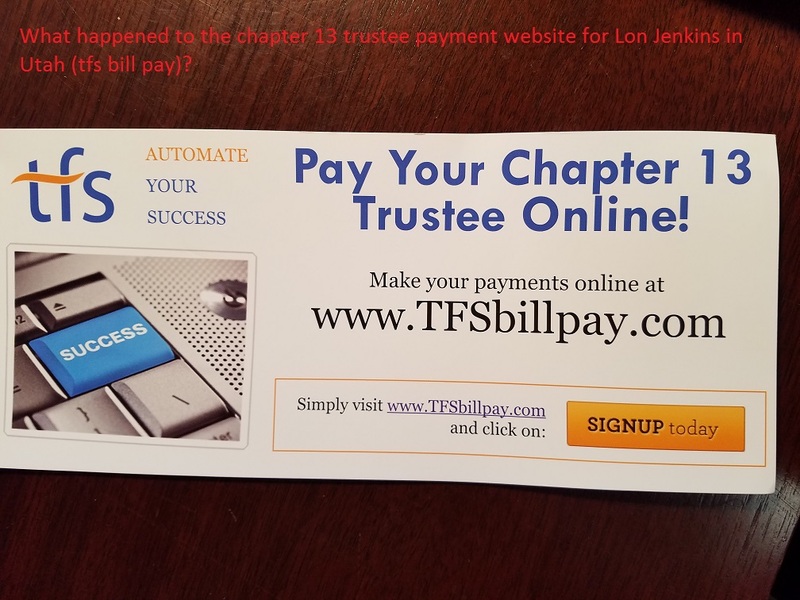 What happened to the chapter 13 trustee payment website for Lon Jenkins in Utah (tfs bill pay)? 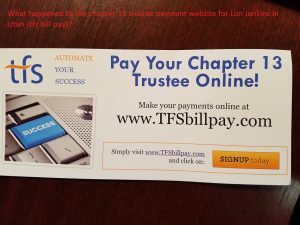 For the last few years, you could make your online chapter 13 plan payment at the trustee website using their bill pay service. Now, when you click on their “Debtor Payments” button, it takes you here: https://tfsbillpay.com/ . It’s a new service, but clicking through their screens, it seems fairly straightforward to use. Just don’t forget your case number. It seems to be a MoneyGram service, and unfortunately, yes, it does have a transaction fee of $8.99 per payment. So if your plan payment is $100 a month, then you’ll be paying $108.99 each month if you use this service. That is worth it, because you’ll receive immediate confirmation of receipt. Use MoneyGram in time-sensitive situations like a dismissal hearing, before confirmation, or catch-up payment…. Once your payment leaves your hands, it’s tracked and guaranteed to arrive at your trustee’s office. The only bit of mild misinformation is the trustee’s statement that you can “Talk to your Attorney. They can print your MoneyGram card straight from their office.” No, I can’t. This entry was posted in Utah Bankruptcy on June 29, 2017 by robertspaynelaw. What documents do I need to bring to my 341 Meeting of Creditors with the bankruptcy trustee (2017 revisit)? I covered this in 2014 (see below), and it really hasn’t changed. About a month after we file bankruptcy, we meet with a bankruptcy trustee assigned to your case. It is his job to determine if you have any non-exempt assets (things I cannot protect) that he can sell off so that he pay a portion of those proceeds to your creditors. 3. a current paystub (to show that your income is consistent with the paperwork we filed with the court). At the meeting the trustee may demand that we produce other documents, like vehicle titles, or a copy of your divorce decree. If you’ve already disclosed everything to your attorney, none of the trustee’s questions or demands will be a surprise at all. 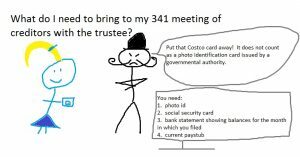 If you are missing one of the essential items, like a driver’s license or social security card, the trustee may even refuse to conduct the meeting and will reschedule it when you have those items. driver’s license — you can actually bring any government issued photo i.d. I have even had clients use their concealed carry permits (which seems like a vague threat to the bk trustee, but is really innocent, I hope). No, you cannot use your Costco card, and yes, I have had clients try to use the Costco card before. 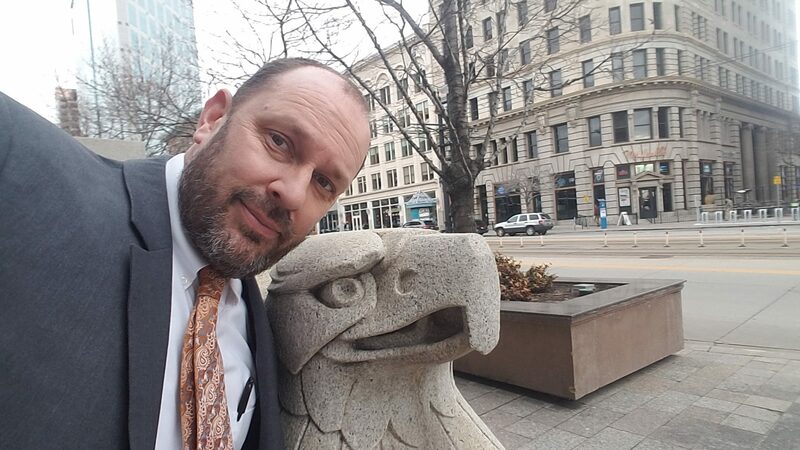 social security card — anything issued by a third party with your social security number will work, including a W2 or a 1099. i have even used a lawsuit where the creditor put the debtor’s social security number on the caption of the lawsuit to identify them (old lawsuit. We don’t do that kind of thing nowadays). bank statement — if you don’t have it, you can email an electronic copy later, but the trustee will not accept your online bank statement off of your phone. I probably have at least 1 client a month try to do that, and the trustee does not want to handle your phone. paystub — same as the bank statement. If you don’t have it, you can email it later, but you cannot show a copy of your paystub off of your phone. 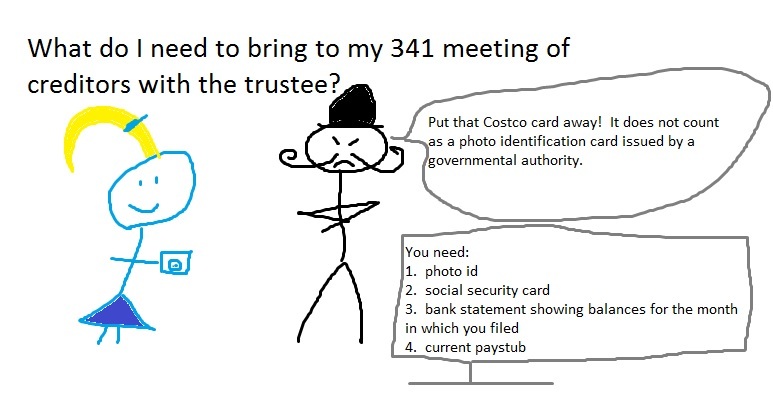 What do I need to bring to my 341 meeting of creditors with the trustee? This entry was posted in Utah Bankruptcy on June 7, 2017 by robertspaynelaw. 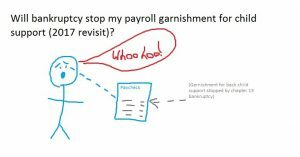 Will bankruptcy stop my payroll garnishment for child support (2017 revisit)? In 2014 I wrote about this (see below) and said, ‘No,” but it’s a little more complicated than that. Filing bankruptcy won’t affect your normal monthly child support payments. But, it can affect back-child support. Let’s say that you pay $500 a month in child support. You are behind, a lot, and they are garnishing that $500 plus another $250 a month for back child-support. If we file a chapter 13 case and propose to cover the back child support as part of your chapter 13 payments, then ORS will go back to garnishing the original $500. You still have to pay the back child support as part of your chapter 13 case, but it can be stretched over your 5 year (60 month) chapter 13 plan. So, technically, filing bankruptcy can stop some of your payroll garnishment for child support. 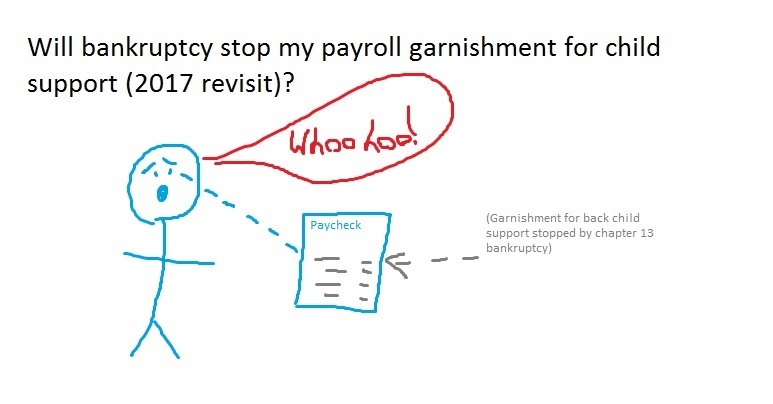 Will bankruptcy stop my paycheck garnishment for child support? This entry was posted in Utah Bankruptcy on June 5, 2017 by robertspaynelaw.